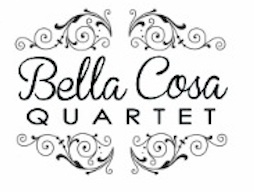 Please fill out the form below to have Bella Cosa Quartet contact you with more information! Bella Cosa means simply ‘Beautiful Things’ in Italian. It’s a fitting title for a band of this sound. Bella Cosa is referred to as ‘The Romantic Band’. This little group is a 3-5 person set-up typically. The 5th is typically a fiddle. Bella Cosa has a unique soft and romantic sound that is so beautiful and different from common fare, that you’ll want to come back and share it with one you love, when you hear it. The sound, although being honed from years of study and diligent arrangement, is described as ‘Gypsy Jazz’ or the Django Reinhardt sound. Given the bands unique setup, there are also elements of Chet Baker, Michael Buble, Ben Webster, and Freddy Green with a healthy hat tip to the flair and sensibilities of the French ‘Hot Jazz’ sound.